Peniche to Ericeira (62km; 718m) was a hell's day of riding. I could have handled the steepness of the hills, the gale force headwinds or even the arrogant, road-greedy truck drivers that continually pushed us off the side or drove so close that you got sucked along in their stream. Very scary stuff indeed. But when it began to pour with rain going up the 12%, hill just before reaching our destination, I had had it! I screamed as loud and as hard as I could. I let everything out and it's these times that you begin wondering what the dickens you are doing. Riding a bike around the world. That's only for idiots! But soon after these moments of despair, when you've calmed down you know exactly why. Can't explain this in words yet, but that'll come. The campground in Ericeira was super and had every possible amenity to make things comfortable and pleasant. And it was certainly needed that evening, because it stormed a beauty. We resorted to a cold dinner of cheese, olives, apple salad and bread in the tent because there was no chance to light the cooker and sit outside. The next day was calm, pleasant and sunny and we had a easy trip into Lisbon (51km; 635m). Passing through the outskirts you witnessed the rather unpleasant sights of a big city's poverty. Two days later, we took the bus into the city and the route took us through a much more affluent area. Everything was neat, tidy and well arranged. It was so apparent that there are the well off and the not so well off in Portugal. And there appears to be a huge gap between the two. The campsite, half hour ride by bus from the city itself, was surprisingly okay except the stench from the toilet blocks and outrageous prices in the supermercado [supermarket]. We travelled into the outskirts of the city the next day to get Ali's eyelets welded back on his bike. Ending up in the back streets at a car mechanics, Tiago - the brother of the bike repair shop owner - chatted away in brilliant English, while happily welding and spraying Ali's bike back together. Lonely Planet warns that you need to take everything with you into Portugal, but this is not true at all. There are plenty of trendy mountain bike shops in the cities - with prices to match of course - and even a few amenities in the smaller towns too. Furthermore, you can purchase standard parts from the chain stores: Sportzone or Decathlon. We visited the centre of Lisbon on a Thursday, which unbeknown to us was a day when all the shops are shut. Still haven't worked that one out yet? There was a demonstration in the late afternoon and of course this disrupted the transport system so that we arrived home very late to cook in the dark. We had a nice break in the capital for 4 nights before heading on down the coast. The weather had also held good for the complete stay. Getting out of Lisbon was easy. There was another demonstration and the road blocks meant we had to weave in and out of traffic queues, pedestrians and on footpaths. Still it took us just over 30 minutes to reach the ferry terminal that took us to Barreiro. From there we cycled into Setubal (51km; 358m) and decided to pitch the tent early that day. There were two campsites just out of town (Outão) and we chose the one on the beachfront. Don't know what the other one was like but it couldn't get much worse than the one we were at. The whole site was full of permanent vans with attached tents and there were only about four spots to choose from; all in the blazing sun and with no tree in sight. No-one smiled at us at this campsite. Outsider syndrome, I reckon! Anyway, we wanted to update the web site and check our mails so off into town we went with the hope of finding an internet café. After a lot of biking around and yet again following directions from misinformed tourist office employees, we finally went to a copy-shop that we had spotted on the way into town. Unfortunately, after a couple of tries (our Lacie hard drive not recognised), we abandoned this plan and consolidated our non-eventful intentions by sitting on a terrace and sipping an ice cold beer out of the bottle. The glasses looked as though they had been rolled in fat, otherwise we would have used them. By the way, Lonely Planet recommends this town if you really want to see Portugal for "what it is." We left as soon as we could the next day. We needed to catch a ferry to the Troia Peninsula and met a couple of Spanish guys (George and Michael) on lightly packed bikes heading towards Seville. They recommended Porto Covo (96km; 490m) and so we decided to see what was on offer there. The trip was very boring. No where to stop along the way and nothing of interest to see but pine forests, military fences, shrubs, more shrubs and sand. As consolation, the roads were good. I found it rather frustrating that the beachfront was only a kilometre away or so. One break in the boredom was the majestic image of storks standing on top of their almost human-size nests on the uppermost perch of buildings and electricity masts. The last stretch of road into Porto Covo was dangerously narrow for us and obviously frustrating for some of the very impatient drivers. We reached the campsite early enough and were once again disappointed by the lack of good pitches available for tents. Everything is geared towards camper vans and caravans and it's beginning to become extremely annoying. To further taint our freedom; daylight is out really early now (7.30pm) and it is still dark until about 8am; makes it difficult to achieve a lot in one day, when most of it is taken up with riding. Our next stop was Lagos (116km; 911m). Weather was beautiful and it was also quite a hilly ride with 911 metres of altitude. We got into town really late, did some shopping at my favourite store: Pingo Doce and then followed a sign to a campsite that no longer existed - down a 17% hill that Ali had to cycle back up again afterwards. I had rather smartly, waited on top. Rather dubiously, we took the other sign in the other direction, but this time it did lead to a campsite. Again a stretch of rocks and sand with a price tag for those seeking refuge for the night. The next campsite was even worse: Armação de Pêra (42km; 263m). This town was also obviously catering for the British tourist with bars offering fish and chips on Friday, roast beef on Sunday and full English breakfasts available all day long. The beach was pretty okay, if you don't mind deck chairs and umbrellas lining the waterside. Our luck with campsites changed the next day when we arrived in Olhão (62km; 351m). Well equipped, pleasant and helpful staff, oldish but very clean amenities, internet service and local priced bar and restaurant facilities. Nice sites with lots of trees. We managed to find a fairly quiet area with a flat piece of turf to camp on but towards the end of our stay it became more raucous with the addition of a Spanish family and several overly large camper trucks from The Netherlands with attention seeking occupants. We had chosen an opportune moment to leave. Met a Dutch couple a few days later in El Rocio who had camped close to where we were and left after one day because it was also too raucous for them. We only needed to cycle a short distance to reach Monte Gordo (45km; 231m) near the ferry crossing on the border of Portugal and Spain. Nothing really prepares you for bad campgrounds, except, when you seem to be stumbling across a string of them. Monte Gordo is pretty bad, but the following night we cycle into one of the grottiest places I have ever dared set foot in. We had decided not to mention bad places but it seems that besides the fact that it cost an outrageous 15 euros a night, this one is really a health hazard. So our message is: stay clear of Mazagon (95km). Camp wild; go four kilometres further on to the next campsite; use one of the cardboard boxes on the roadside; do anything but stay here. Our ride that day had revealed both sides of every scale too. We had rain and sunshine; very good and extremely bad roads; cycle paths and highways; nature and enough industry to remove most of your nose hairs in one sniff. We first stopped at a campsite about 30kms earlier but they wanted 21 euros (2/3rds of our daily budget) for a sloping sand pit. Although it was spick and span and a worrying 4pm, we promptly left and decided to take pot luck. That's what we go for sure. Adding to the misery, the next morning it bucketed down enough to keep us in our tent until 10.30am. Upon exiting, we were amazed that our area was surprisingly dry. All around us however, the puddles reflected the blue and green tarpaulins from the permanent erections that filled the place. Half were growing signs of stagnation and the other half were for sale, if that gives you an indication of the state of affairs. So it was a very late start - around 12pm - but nonetheless, we reached El Rocio after a very easy 42kms. The whole way we were heading towards that hopeful little patch of blue in the sky. All around us, however, the greyness continued to close in. The landscape was dry and quite barren except for olive groves that went on further than my eyes could see. We managed to get the tent up and have a shower before we were hit with the realisation that the 13 days of glorious sunshine were well and truly over. It bucketed down again; continuously well into the next day with thunder and lightning and all the other noises that go along with a wild wooly storm. About the only good thing is, people feel sorry for us and start a conversation or offer to help out. This lead to some great exchanges of travel stories with some very interesting couples from The Netherlands. El Rocio is just as its name suggests: a place where all the roads are dirt and the houses resemble a western town out of High Noon. At the weekends everyone comes here to play cowboys and girls. Unfortunately, we don't get to witness this act of frivolity as it is the beginning of the week and seeing as there is not much more to experience here, we move on to Dos Hermanas (80km). After the habitual morning downpour the next day of course.. You couldn't have asked for a more contrasting image; a town of complete renovation. New apartments and buildings going up in every corner possible. All of this is happening around a city centre where you can easily get lost in the one-way cobbled streets. There's a lack of supermarkets and bread shops and we experience the annoyance of the Siesta opening hours once again. You really have to be prepared in Spain and plan when you are going to purchase your supplies. Most shops close at 1 or 2 pm and don't open again until 5.30pm. Since it gets dark at 7.30pm, this doesn't give you much time to cycle into a town, shop, find a camp spot, shower and then prepare and eat the evening meal. On the odd occsasion, due to difficult terrain or inconveniently placed towns, we had to shop at the beginning of the day. Only downside of this is carting all that etra weight up and down the mountains. I am keen to stop for an extra day here and do some washing and other chores, but Ali promises me that we will reach the beachfront the next day and we can relax in the sun on sandy shores. He is right about the beach bit, but unfortunately the weather doesn't permit the sun baking - not that there has ever been time for that, so far in our trip. 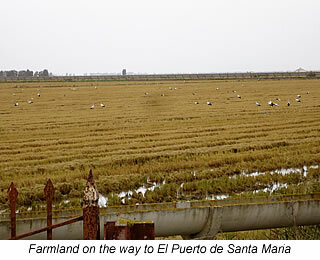 The journey to El Peurto de Santa Maria (107km) is very hard work. Despite the fact that I have two flats within half an hour, my bottom bracket nearly falls out and it consequently feels like I am pedalling a lump of sponge around, we manage the distance in reasonable time. It is however, a highway in every sense of the word. Triple lanes and raging traffic, where we have to come to a complete stop to cross to the inside curb on numerous occasions. Vehicles roar past at well over 100km/hour. It is exhilarating, to say the least and when we reach the well manicured campsite we are both pretty exhausted. I can't remember falling asleep that night, but I do remember enjoying every moment of rest. The next day is spent trying to find a bike shop to replace my bottom bracket and again the opening hours stop us from achieving everything else we want to do. Luckily, the bike shop manages, in their busy schedule, to fix my bike, which means we can leave the next day. Tarifa (108 km) is, according to the Lonely Planet, a Bohemian town. My experience is, it is more of a dread-locked yuppie, kite surfers sort of town with a few other not so distinct travellers camping overnight before venturing further along the coast or jumping continents to Morocco. We meet Lucas here: another cyclist. He is heading towards Africa. This is the first time that we face the chance to radically change our plans. What if we turn the applecart upside down and decide to go to Morocco and travel down through Africa? I mean, what is stopping us? We do think about it and I even plan a route backwards from Brazil and through America and into Asia; then Indonesia to Australia. But then we would miss out Italy, Greece, Turkey, Iran, Uzbekistan, Turkmenistan and I suppose ...we'd really like to see these places as well. So, it's on with the original plan. Tomorrow away and heading towards Malaga before Alicante for a long earned rest. Well at least that was the plan. However, it poured from mid afternoon on the 23rd until 12pm the next day and we were stranded once again. The campground just out of Tarifa is pretty okay though with some well seasoned travellers prepared to relive an experience or two with you. Some of these guys have been on the road forever. I just hope we can hit it tomorrow. There's no cycling info here because I wouldn't recommend this section of Spain to my worst enemy. Unfortunately, you are forced to use the autovias [highways], because there are no alternative routes. Drivers are impatient and have little respect for anyone but themselves and I have never been so scared nor felt so helpless in my whole life. I never would have imagined facing this attitude so early on in the trip. We've cycled in South East Asia and read enough first hand stories from others about the pecking order of cyclists in many second and third world countries. I didn't know this mind-set was here as well. Since the rain in Tarifa, I have been getting grumpier and grumpier about the weather and looking back on it, a little unfair on Ali, who is the eternal optimist. I just thought it would have been fairly smooth sailing at this stage in our travels. Sunny beaches, white sand, great summer weather and after a hard days work, which I've never minded at all, relaxing by the tent in the evenings. Sure it's got to rain every now and again because that's life; but if you've been following our story you will have realised this picture is far from the reality we have been experiencing. Luckily enough, Tarifa is a nice place to camp and we can chill in the restaurant-bar playing backgammon and cards while the showers continue around us. On the down side, there is the enormous price tag of twenty euros a night for this patch of grass. In addition to that, you have to pay for your bicycles in Southern Spain. Up until now, we have experienced that only once. Down right cheeky really. In fact, it costs more in this campground for two persons, a tent and two bikes than it does for two persons with a caravan carting a couple of bikes on the back rack. As soon as we point this out to the guy at reception, he charges us the same as the caravan package. But, I'm sorry to say, something is still a little wrong. Anyway, to stop me from being a right proper pain for the entire trip to Malaga, the sun shines as we leave Tarifa. We push up a couple of quite easy passes. Maybe it is my slightly saddened feeling about not opting for Africa, but I am panging to see something different. Something non-European. Something exotic. And the events that follow somehow trigger a feeling that maybe we hadn't made the right choice. Ali would say that's rubbish and that there's no such thing as fate. I on the other hand, am not so sure anymore. On this particular day, we nearly die twice on the highways due to a couple of insane and radical maneuvers at exit lanes. Ali skids in some oil on a round-about just before Algeciras and ends up spread flat in the middle of the road, minus his packs on one side. One of his Ortlieb bags and his right knee doesn't stand up to well to the accident. Mid afternoon and well past the Rock of Gibraltar, we are cycling like mad to try and outride the black skies coming in from behind us. Our efforts are in vain and within seconds, it is as if someone is throwing buckets of water over us at close range. Going down a hill, with this sort of rain means the brakes don't really work, so all you can do is hang on for dear life. A well appreciated bus stop is where I chuck another weather-wobbly. After the ferocity dies down a bit, we cycle on in the drizzle for the rest of the afternoon until another timely stop under a viaduct prevents us from getting even wetter than we already are. Our main concern now is, it is getting dark and we still haven't shopped for our dinner nor found somewhere to camp. A quick detour through the town to the tourist bureau has us heading back out again towards the highway. The roads are incredibly busy. It is peak hour and the rain filled potholes are indistinguishable. Ali hit one at a decent speed and his other backpack flew off. Luckily enough, it all happened on the curb side of the street and at one of those moments when I wasn't sitting right behind him. We pull up on the sidewalk to repack his gear and noticed a female proprietor anxiously pacing under the canopy of her fancy shoe shop. She looked most uncomfortable that we had placed ourselves in close proximity to her store. Bad for business I suppose and to be honest we must have looked a sight; saturated from the days downpours, mud from head to toe, collected off the highways and our bikes in practically the same condition. There are three campsites in this area. The first, 8 km out of town and a ridiculous 25 euros per night, looked dark and dismal. So after picking up a few supplies from the SuperCor [The Spanish equivalent of a 7-11], we ventured on in the drizzle. We arrived, quite relieved at the next site 4 kilometres further on in Marbella (117km; 1043m), only to be told that we couldn't camp there. They had a policy of not accepting tents in the winter season. The woman explained that they didn't want to take responsibility for what may happen to us during a storm and according to her one was on the way. Well, she wasn't really telling this couple of cyclists anything new, but surely it is our decision to take a risk if we want to. And on that note, we have to give our Helsport tent a 10 out of 10 score. It has kept us warm and dry through some of the strongest storms. Of course, the campsite owner wants to earn money. So, after Ali diplomatically and quite charmingly explains that it may have escaped her attention that we are on bicycles, it is almost dark now and that cycling the highway is probably more of a risk, they take our 14 euros and let us stay. But only at our own risk! We pitch and very willingly go to sleep after warm veggie soup, bread, chocolate and reliving the day's danger moments. The next day had a promising air about it. The weather pattern had broken and we only needed to find somewhere to stay close to Malaga because I had the first of my 4-monthly checkups with a periodontist on the following morning at 9am. I had been dreading this bit since I found out the news about my teeth in August last year, but it was all relatively simple to organise. I e-mailed a clinic that I found on the internet in Tarifa and mentioned that I would be in Malaga on the Thursday or Friday. I received a prompt reply the next day that an appointment had been made for me on the Friday and could I please confirm via e-mail. After what I went through in The Netherlands to get an appointment with a periodontist, this was a piece of cake! 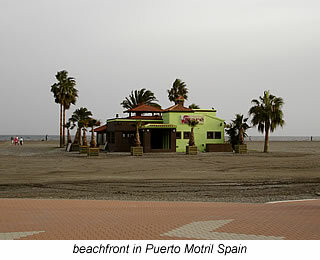 The trip was highway for the complete 37 kilometres to Torremolinos (37km; 245m). The early arrival at the campsite along with the warm sun and slight breeze gave Ali a chance to repair the Ortlieb bag with bike puncture patches and silicone and myself to do the never-ending laundry. Situated 7 kilometres from the city centre of Malaga, we gauged an hour would be ample time to get to the clinic in the morning. We rose at 7am in the pitch black, left at 8am still in darkness and arrived rather distressed and without a minute to spare at the clinic just after it had begun to get light. Fourty-five minutes of cycling in the dark across Spanish highways in peak hour traffic is an experience I would like to forget. After pressing the buzzer to the majestic old building, right in the centre of Malaga, I trundle up the staircase to the first level. I am let into a completely different world: baby blue walls, white ceilings with elaborate cornicing, brass fittings and waxed wooden floorboards. Quite a civilised break from the mayhem I had just faced. Picture frames house numerous lithographs which immediately catch my eye and keep me entertained while sitting in the glassed-off waiting room. Behind reception hangs a polished steel logo of the business. Even the toilet is fitted with fine porcelain, stainless steel and I can't forget to mention the Calvin Klein and other chic brand name perfumes at your disposal. Adrian Guerrero personally checked my teeth and gave me his opinion before leaving me in the hands of one of his hygienists. She meticulously grinded, scraped, cleaned and polished my teeth for almost an hour. This visit cost 65 euros. What a shame I didn't know about this bargain, when I first moved to the Netherlands. I step out of the dream world and back onto the reality of highway N340. The drizzle starts soon after Malaga, worsens along the way and is replaced by gale-force headwinds in the early afternoon. It makes the ride up and down the coastal region of Costa del Sol incredibly difficult. There is a constant flow of trucks and cars and buses and anything that can move faster than us. We grow increasingly irritated by their extreme closeness. Adding to the frustration, the headwinds make, what would normally be a fair days workout, an energy zapping experience. At some stages, I have absolutely no control over my bike. I have to let the wind take me and allow balancing from side to side to keep me upright. I have been lagging well behind for a while and am hoping to stop in a township for something to eat and drink soon. After the climb out of Nerja, when I manage to catch up to Ali, I am rather annoyed to find that it we have just passed the last shopping chance for quite a while. It was partly lack of communication, stress of the full-on day, the trip to the periodontist, the crappy weather conditions and just the sheer frustration of feeling so vulnerable in the traffic that sparked it, but I pulled up in a parking bay and flipped yet again. I just couldn't see the fun in it anymore. Personally, if I had done this alone - and that's an "if" in itself - I would have jumped on a train with my bike by now and gone somewhere else. If, every third day or so, I saw something stunning, that blew me away or gave me goose bumps, then it would be worth the two days battle with traffic, highways, wind and rain. But if I'm really honest, I haven't seen much in our Spanish tour so far, except the Pico's and the Pyrenees, that has really touched me at all. The beaches along the Costa del Sol have black sand for goodness sakes and are far from spectacular. They do however, sell everything English, German and Dutch, if that's any consolation. Everything is over-developed to the maximum. The countryside is one huge construction area and it seems that public spaces and especially roadside curbs are used as rubbish dumping grounds. Anything that doesn't work can be found discarded here: televisions, fridges, car parts, baby pushers, not to forget the copious amount of plastic bottles, cans, glass, waterlogged diapers - that look like they'll explode any minute - and the days leftovers from a park side picnic. The other rather alarming issue is the amount of cadavers roadside that, as a cyclist, you have to swerve around or you and your bike might end up in a pretty messy state. They are everywhere and some of the sights we have witnessed are enough to give you nightmares at night. It's quite possible that you'll miss this side of Spain from the air-conditioned car or bus and to be honest, the touristy spots are pretty clean: to give the right image, of course. Travel a few kilometres out of these spots and into some of the smaller townships and it's another story. As a cyclist your senses are heightened; you see, hear, feel and smell almost everything. Not such a pleasant thing everywhere in the world. But anyway back to us: both in a parking bay on top of a hill, feeling miserable. This time it is Ali's turn to flip. It is for all the same reasons I had let loose plus the added strain of my never-ending whinging. All he could get out between the tears was, "I just want to enjoy myself with you!" I felt like a right proper jerk and immediately sorry for not endeavouring to look on the bright side of life; which he does do to perfection. After cuddling him as close as I could while still perched on my bike, saying sorry over and over again, I promised him I would try to look on the bright side. In Spain, they relentlessly beep their horns. They say hello with them; they let you know that they are overtaking by tooting; they relieve their frustration in a traffic jam with long blasts; and they accordingly warn you of danger too. Seeing as a "toot is just a toot" to me, you can well imagine, it's all gets pretty confusing. Maybe it's a tonal thing that we have not yet worked it out, but when the truck beeps his horn from quite a distance behind me, I think nothing of it and continue to cycle along the tiny gravel covered shoulder available for slow moving traffic. The next thing I hear is Ali screaming: "Quick, get off the road Son!" I do and in just enough time to feel the truck whisk by with only centimetres between him and me. Had I stayed on the shoulder, then I firmly believe that I would not be writing this now. And since emotions were already high that day, the tears just flood out. So much so, that I have to stop because I can't see anymore. I still can't believe the arrogance of the guy behind that wheel. What would he have done if I had've stayed on the road? What if I didn't have space to pull over? What if it was his daughter on a bicycle along the highway? Would he have done the same thing? A little further on, he had to slow down for a road block, or did he just fly through that as well? I guess I have to get accustomed to it if I want to stay alive, but I will never accept it for normal behaviour. We have to pass through three tunnels today and it is pretty scary stuff as well. The longest, being only 650m, still seems like an eternity and we have about 50 centimetres of shoulder to cycle on with cat eyes strategically placed in the middle. The grates on the side are sunk 10cm below the surface so it is concentration the whole way. Upon exiting, I breath a sigh of relief. Ali does as well, so he tells me later on that night. Most of the day's disheartening events are forgotten when a truckie toots before slowing down and shepherding us through the last tunnel. Thanks to him, our faith is restored in human nature. Arriving late in Puerto Motril (107km; 777m), the storm is in full swing. We had to push like crazy to get ourselves down the hill leading into town. We are once again disappointed at the state of the campground, but that is only a minor detail. Our legs are aching and we are in need of a warm meal. I smother Ali in kisses all night because he deserves them and say repeatedly I am sorry. We plan our escape into the mountains for the next day, but unfortunately the storm is still around us and forces us to stay another day in a place where we would rather not spend anymore time. We visit the town of Motril, with the most exciting moment being when we find a wifi point near the Tourist Office, so we can update the site. The next day we manage the great escape. We should only travel in the mountains. We seem to encounter fabulous weather when we do; the Pyrenees; the Picos and now here in Granada. The trip from Puerto Motril to Granada (86km; 1475m) is not for the weak hearted as it is around 50 kilometres of climbing an average of 4% gradients - It takes us more than seven hours. At some stages during the ascent, I am secretly hoping that it will level off - just for a little breather, but it still keeps on at between 7 and 12% inclines. Of course, you always make it to the top. Something inside seems to keep you going, even when you think you haven't got enough in you. At the end of this journey, I realise that we are now both really physically fit. Mentally, I may still need a bit more work, but I reckon Ali could climb his way to heaven. Although the day starts out very overcast and we can only see our immediate surroundings - always a bit of a bummer when cycling in the mountains, the weather turns out to be just perfect. We are blessed with beautifully clear blue skies, which also means it is baking hot in the sun. Constantly dripping with sweat, we need several water stops along the way. The first part of the day takes us through very small villages with not much sign of life. The road is good and with very little traffic - for Spain that is. We need to take a 10 kilometre stretch of highway to shorten the trip by 20 kilometres or so and in hindsight, I'm not so sure whether it is worth it. It is just as nerve-wracking as any other Spanish highway, except for the decent sized shoulder. A continual flow of fast cars, trucks and buses create that incessant "whaaaroom" rhythm as they fly past. We are glad when we can turn off onto the alternative route again. This takes us up and down like a couple of toy yoyos until we reach the valley just before Pto del Suspiro del Moro. The surroundings have been spectacular all day: rugged limestone rocks jutting high into the sky and us like tiny ants crawling our way up their sides. It is these moments that make you realise exactly why you are doing this. You get an amazing sense of freedom being in such majestic nature and it makes up for all the not so nice traffic experiences. From the peak, it is almost downhill all the way into Granada; a modern, very fast-moving and rather chaotic from a cyclists point of view, city. In fact, Granada makes London seem quite orderly. It has all the mod cons of course and a chance for us to find some badly needed additions. First on the list is a light that attaches to our battery. Daylight savings has finished, so it's dark at 6.30pm and that's way too early to get into bed. We are normally just starting to cook dinner by this time. Also on the list are a few bike spares and lubricant, but the most challenging quest is going to be trying to get our Sony cybershot camera fixed. Three pieces of dust have managed to find their way inside the lens, which for obvious reasons is very annoying. After several emails and with absolutely no response from Sony in The Netherlands - minus 10 points guys, we get a reply from the Spanish customer service. There's an authorised dealer-technician in Granada, so our fingers are crossed. We take a day off to visit La Alhambra; one of the most famous of the Moorish castles built in the 13th century and the last one to be taken over by the Christians. It costs ten euros each to get in, but is certainly worth it. We are kept wandering around for a number of hours and there is a certain calming effect being on top of the hill viewing the the bustling city below. We manage to find a nifty little light for our lead acid battery which normally plugs into the cigarette lighter of the car. Taxi drivers usually have one of these. Cycle parts are dead simple to obtain as well, since there are plenty of bike dealers in Granada. The Sony story is not as promising. Apparently, the lens needs replacing on our Cyber shot which we are not very happy about. It cost 329 euros and is only 14 months old and we are now being told we need to make a repair of more than half the camera's value. The emails are out, but I don't like our chances up against a multinational. We'll keep you informed.